Wooing Trader Joe’s to your downtown. What does it take? Most of the time, I use this question to start a conversation about the metrics that Trader Joe’s uses to select sites, and then we work through what kinds of things need to happen downtown to move the fundamental metrics in the right direction. But then I get the question from someone else and we start the conversation over again. For the Rego Park site, which is in a more “urban” market than the two others, we looked at a .5 mile radius from the store. We then compared the Rego Park site to a 1-mile radius around the Clifton, NJ and Staten Island, NY locations, which are arguably more automobile oriented. What is the median income of the primary customer? First we looked at income. 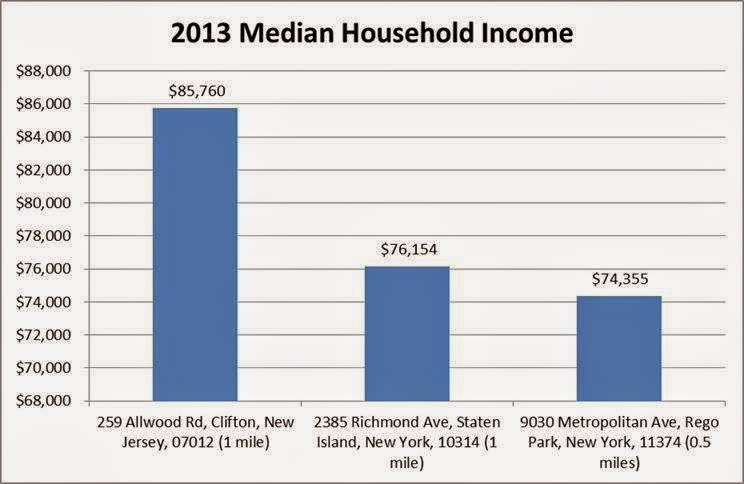 Median household income was between $74k – $85k. When you consider that median income for the US is around $51k, it becomes clear that they seek out communities that are convenient to high income neighborhoods. How many customers should there be in the primary market? Then we looked at household population. 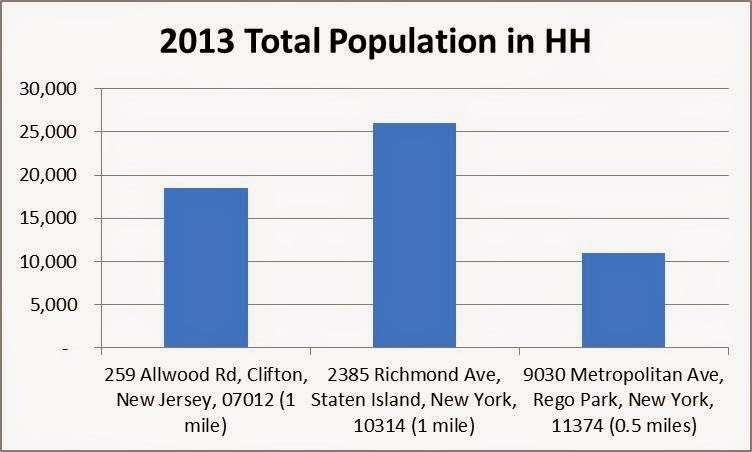 Again, keep in mind that we are comparing .5 miles in Rego Park to 1 mile in more suburban communities. If we consider the fact that our Rego Park site is a .5 mile radius (and therefore double the household population for an apples to apples comparison), we are looking at markets that have between 18,000 – 26,000 households within a mile of a site. How educated should the local population be? Another key indicator is levels of education. Trader Joe’s is notorious for seeking pockets of highly educated consumers. The thinking is that more educated consumers have traveled and are somewhat more worldly and therefore open to trying the sometimes quirky offerings at Trader Joe’s. 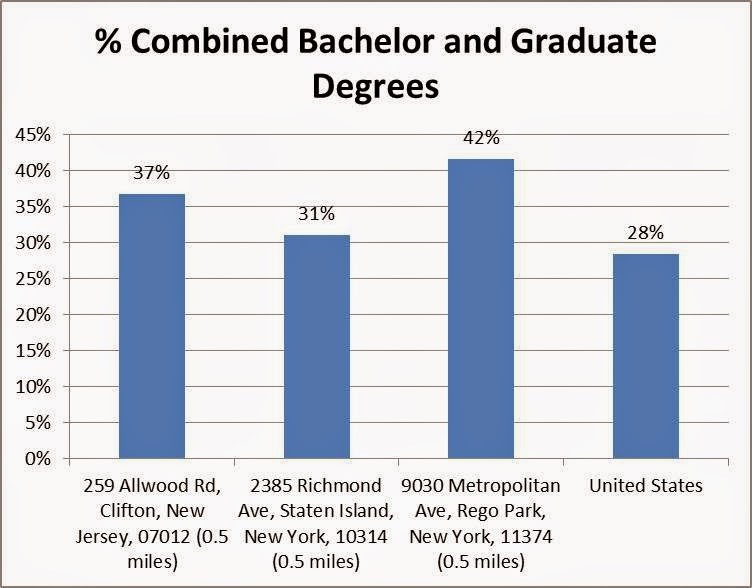 In every case, the lowest threshold of population with either bachelor or graduate degrees was 30%, and in both New Jersey and Rego Park, Queens, the threshold was significantly higher – closer to 40% when considering the U.S. average is 38%. So, before you jump to wooing Trader Joe’s – a tall order for most communities – first take a peek at your demographics and see if they pass muster.